Would you like to learn a new skill and meet new people? 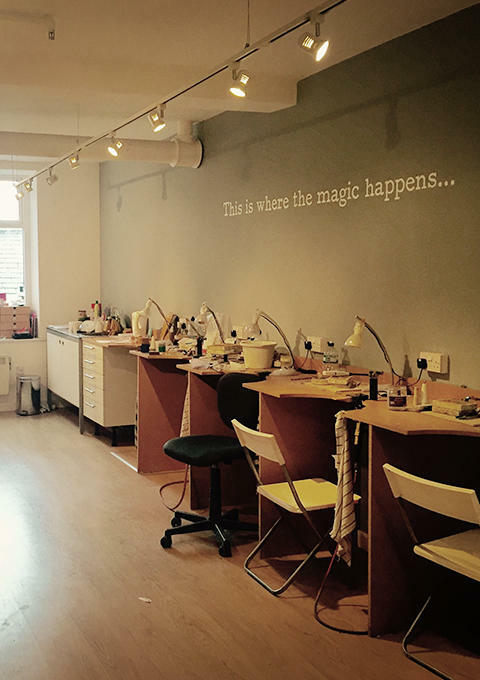 Learn traditional jewellery making techniques and produce your own designs in metal in a brand new workshop with our experienced jewellery tutor, in Farsley, West Leeds. We have a Tuesday night class starting again in September. This class runs for 6 weeks blocks. It's a really popular course with a waiting list but classes do come up so please contact us to join the mailing list if you are interested. Please call or email us for more information or to book. Have our undivided attention and work in our workshop with a tutor all to yourself, or bring a friend or two and share the expertise. Ideal if you have a specific project in mind or if you struggle to commit to a regular time. £30/hour, for a minimum of 3 hours at a time. Spend a Saturday in the workshop and make a textured bangle, or a slim stack of bangles. Suitable for beginners or if you are 'rusty' and would like to recap your jewellery skills. Come and have fun with our hammers and create interesting textures and finishes on silver, with a yummy lunch included! Our next dates will be in October. Join our mailing list to be kept up to date.